The 8" candles are pictured on the far right. The slim and standard 12" taper candles are on the left and center pegs, sold separately. Priced per pair. 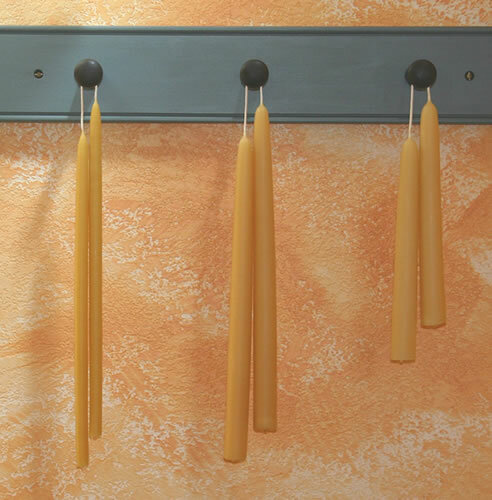 Our tapers are classic candles dipped into pure molten Lightly Filtered Beeswax at just the right temperature by a steady hand and a keen eye. They are dipped and cooled over twenty times each before they can be cut free from the oak rack. When finished and hung, they carry the rich scent of honey. Kept out of drafts and away from fans, these 7/8" tapers will burn virtually dripless at a rate of approximately one inch per hour. Available in Traditional Raw or Filtered Ivory. Please use the options menu to select your color preference. They burn well with hardly any dripping and they smell good, too! Nice tapers; however, they didn''t fit the base of the hurrican lamps I purchased. No big deal as I ended up using them in my crystal candle holders I have out on my dining room table. They still look good! Great qaulity.Will be purchasing more. It''s burnning evenly with no dripping, no mess to clean and no smoke. The candles are not beautiful but the lighting has a pleasant glow. CANDLES LOOK GREAT AND BURN WELL.A GREAT PRODUCT.